Michael Tennesen is a science writer who has written more than 300 stories in such journals as Discover, Scientific American, New Scientist, National Wildlife, Audubon, Science, Smithsonian, and others. He recently published his book, The Next Species: The Future of Evolution in the Aftermath of Man for Simon & Schuster. *Tennesen is a Writer-in-Residence at the Cary Institute for Ecosystem Studies in Millbrook, New York, and a Media Fellow at the Nicholas School of the Environment and Earth Sciences, Duke University. Tennesen specializes in what one of his editors referred to as “adventure science.” He’s toured the Andean cloud forests of Peru for Smithsonian and also the Chilean fog forests for Discover to learn how global warming threatens these precious trees. He traveled to Tikal, Guatemala, for Key Porter Books to study the forest and its birds of prey. He flew with pilots dropping water and chemicals on southern California fires for Smithsonian Air & Space. He visited with biologists off Maui and swam with the humpback whales for National Wildlife. He reported on the toxic explosion at a silicon plant in eastern Washington for Reader’s Digest. He descended into limestone caves in Texas to learn how juniper is sucking the water out of the aquifers for Science. 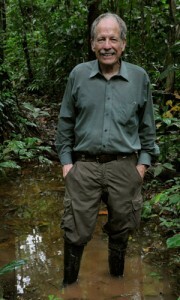 He investigated the murder of Vermont archaeologist Jim Petersen in the Amazon, for Discover. And he recently visited Olduvai Gorge and the Serengeti in Kenya and Tanzania for his book The Next Species for Simon and Schuster publications.